Daisy Bingo got a swanky new look in 2015, but it’s been around since 1997. One of the chief concerns that people had with the site was that they thought it looked unappealing, but after Gibraltar: Cassava Enterprises got a hold of the site in the early 2000s, bingo fanatics finally started to be able to enjoy a page full of games, jackpots, promotions and winners. Many users of the site are very happy with the way it operates, but there are some issues that people spending their hard earned money would want to know. Throughout the review, we’ll highlight the features that we feel most important, culminating the review with our overall rating of the site. It really is a very bright and inviting site. It’s trendy, and there’s lot’s to look at. One of the first things you’ll see (besides the hippy memorabilia) are the amounts that you can win, and the people that have struck it big and made a sizable chunk on the instant games and bingo games that this online gaming site has to offer visitors. They boast the utmost security, ensuring that online bingo fans will find fair play and honest payouts. Plus, they accept virtually any payment you can imagine from PayPal bingo payment to paysafecard, Visa, and MasterCard. You can also access the site from virtually any mobile platform, making gaming easier than it had ever been on the site before. This bingo site has a lot of promotions for players, including a big welcome bonus. You have to deposit at least £5 to get the bonus. You should look at the wagering requirements on their website for the full terms and conditions. They operate off of the Dragonfish software network, which means lots of fun promotions. Grab a Grand Win a cool grand every 15th. Plus, all the tickets are buy one get one free! WOW Spintastic Daily games from Sunday to Thursday get 100 free spins for a full house. You get 50 free spins for 2 line wins, and 20 for a full line. For 1 TG you’ll get 10 spins free and 5 free spins for every TG after that. Happy Hour Every Monday from 4-6 pm you’ll get 2 hours of bonuses. One of the biggest flaws with this online gambling site are the depositing and withdraw features. You have to deposit a minimum of £5. Players can expect to spend at least £20, because that’s the minimum that you can withdraw. Plus, this site has a 4 times your wager requirement. If you win “big” early, without spending the amount that you deposited initially, you have to forfeit your bonus that remains in your account if you withdraw before you meet their requirement. You’ll find every variety of game on this bingo site, from 75 ball games to 90 ball games, as well as progressive bingo jackpots, high speed 5 games, slots and other casino games. In total, there are over 100 slot games, instant win games, scratch cards, and other casino-type games for you to enjoy and share with your friends. 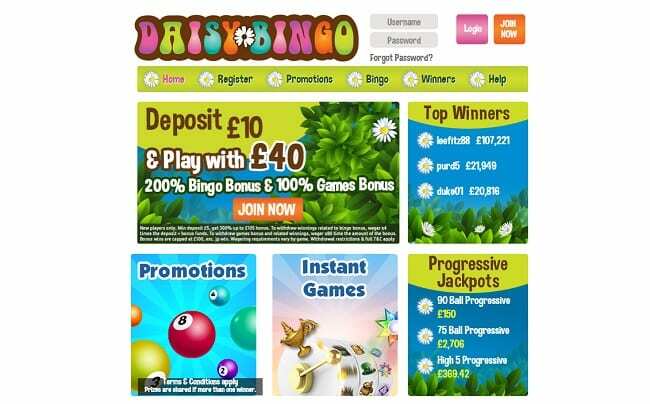 In summary, we think you will enjoy your time at Daisy Bingo. Due to the very low minimum deposit there should be nothing stopping you from signing up and trying out the site. If you would like to make use of the great promotions, make sure to sign up now.